I host a near-monthly free webinar called the Keys to Success, where I break down the details of when Facebook advertising does and does not work. You can register for it here. The webinar is a comprehensive, exhaustive 90-minutes. But I wanted to summarize the primary factors that lead to success (and failure) of facebook ads. Facebook ads are incredibly powerful, but they aren’t magic. Many advertisers have unrealistic expectations that ads will or should always work — or they should be easy. While Facebook gives us all of the tools we need to be successful, there are several reasons why an ad may not work. 1. Your product is broken: If you have a failed concept for a product that no one wants, Facebook ads won’t save you — particularly if your only focus is on selling that product. 2. Your brand (logo, voice, reputation) is broken: You could have a great product, but even a great product is easy to ignore if your brand is broken. You need to invest in a logo and branding, and your messaging needs to be clear and articulate. If your ads reflect an unprofessional, sloppy brand, why would anyone want to engage with them? 3. Your website is broken: You have a great product. Your brand is polished. But you send people to a horribly designed website to read your content, provide an email address or buy a product. That is a critical issue that will destroy your results. “Broken” websites include those that take forever to load, aren’t mobile friendly, have broken pages, or are impossible to navigate. 1. You’re reaching the wrong people: This is something most advertisers — particularly those who struggle — aren’t getting right. They focus on interest targeting only, and interests are often far less accurate than we expect them to be. 2. You’re reaching the right people at the wrong time: Hey, maybe your targeting is actually pretty good. And maybe your interest targeting is solid. But you may be reaching that group of people at the wrong time. For example, interest targeting is typically best for top-of-the-funnel promotion, rather than promoting a product. Targeting those who visit your website would be great for building an email list. And targeting those who subscribed would be great for selling a product. 3. You’re reaching the right people with the wrong message: This is a matter of bad copywriting. You’re too pushy when your audience doesn’t respond to it. Or your messaging isn’t polished or professional, leading to poor results. 4. Your budgets are too high or low: It goes both ways. You can have a budget that is too high for an audience size, for example. You can’t spend $100 per day on an audience of 5,000 people. And the higher that budget is for smaller audiences, the faster you’re going to exhaust that audience. Additionally, you shouldn’t run with high budgets until you find something working, even if the audience size is consistent. Build in some testing time at a lower budget before escalating. On the flip side, advertisers often aren’t willing to spend enough budget to provide results. If you’re selling a $100 product, you can’t expect to spend $5 per day and get the sample size necessary to get any type of results. Similarly, Facebook needs volume in order to optimize for a conversion. So if you are telling Facebook to optimize for conversions but your low budgets only allow you to get one conversion per day, Facebook doesn’t get a chance to get enough conversions to properly optimize. 5. Your bids are too high or low: By default, Facebook auto-bids, bidding what is necessary to reach the best audience for the lowest possible price. But advertisers love to get cute here with their bids. It’s not that you can’t have success with manual bids. But you shouldn’t do this unless you know what you’re doing. A bid too low often leads to low distribution and reaching a low-quality audience. Bids too high may result in spending more than you need to. 6. You’re optimizing for the wrong action: As long as the volume of conversions on your pixel exists, you should optimize for conversions if you want conversions. You should optimize for traffic if you want traffic. You should optimize for engagement when you want engagement. There are exceptions, but advertisers again often get cute here when they shouldn’t. 7. You’re using the wrong ad type for your goals: I often hear of advertisers disappointed in results when they use a video — maybe a great video — and don’t get the conversions they want. Well, that’s due to ad type. Use a video when your primary objective is getting a video view. Use a link (single link or carousel) when your primary objective is driving traffic or conversions. Use an image when your primary objective is engagement. 8. You’re not testing and experimenting enough: You ran one campaign, one ad set, or one ad and you didn’t find success. Maybe you tried two or three times. Don’t give up. Keep trying, but don’t keep doing the same thing over and over. Experiment. 9. You’re not tracking data: If you’re not using the Facebook pixel, you’re pretty much screwed here. You don’t know how many conversions are actually happening (no, Google Analytics isn’t enough), and you can’t optimize for a conversion as a result. 10. You’re focused on the wrong metrics: People often ask me questions like, “What is a good CPC? Or CTR? Or CPM?” In a vacuum, these things don’t mean a damn thing. They are secondary or tertiary metrics. If your objective is website conversions, your primary concern should be your Cost Per Conversion, not CPC or CTR. Worry most about your Cost Per Desired Action. You could have a high CPM, low CTR or high CPC and still get a good Cost Per Desired Action. Or if you chase a good CPC, CTR or CPM, you may actually end up with a poor CPDA. Targeting is listed first for a reason. It was also at the top of the list for why your ads don’t work for the same reason. It’s absolutely critical. I believe strongly that targeting is the most important factor for Facebook ad success — and failure. You can craft the best possible ad promoting the best product, but it won’t matter if you reach the wrong people. The difference between targeting people who know you and don’t know you is huge. I’ve seen it repeatedly. I can spend a great deal of time and effort crafting a cold audience of lookalikes or interests. The results will never come close to targeting those who are closest to me. The image above is a prime example of that. Targeting my website visitors, I was able to drive conversions at a much cheaper rate than I could have possibly done with lookalikes or interests (while maintaining quality). Before you tout your success with interests and lookalike audiences, I know. Yes, you can have success. It’s not as good as targeting those who visit your website most often or engage with your content, but you can do it. Ultimately, though, focusing on a cold audience exclusively is a bad long-term strategy. You may have some success today and tomorrow, but you are more likely to sustain success by targeting those who interact with you, read your content, provide an email address or buy. For most, these audiences will be small. But what that means is that you should commit to building such audiences for the long-term. So, target those who visit your website first. And if you have budget left over, move on down your priority list. 1. Website Custom Audiences: Website Custom Audiences are powerful because they can capture people who visit your website, people who register and people who buy from you. These audiences are also dynamic, updating in real-time. Additionally, Website Custom Audiences allow you to target based on recency, specific pages visited, level of activity, and frequency of actions on your website. They are freaking amazing for targeting purposes and can be a big boost to any campaign. 2. Data Custom Audiences: Back in the day, these were a big deal. Data Custom Audiences allow you to target or exclude people who are on your customer list or use your app. This is great, but this can usually be replaced by Website Custom Audiences. These audiences require you to update them, and if you don’t segment properly they may include people who are no longer relevant. 3. 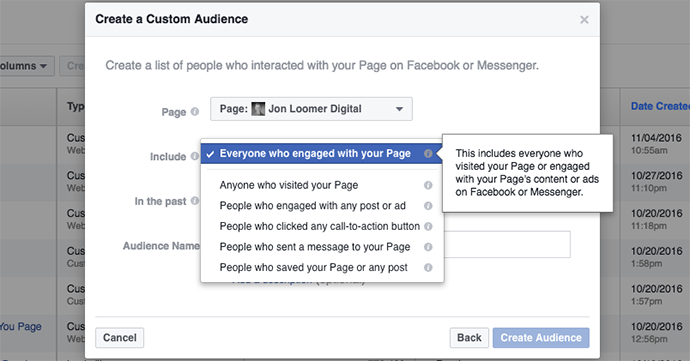 Page Engagement Custom Audiences: You can make an argument that Page Engagement Custom Audiences should be second on this list. These audiences allow you to target people who have engaged with your Facebook page, engaged with your posts or ads, sent you a private message, saved a post, visited your page, or clicked a page call-to-action button. While targeting your website visitors or customers is powerful, they don’t necessarily engage with you on Facebook. What’s great about Page Engagement Custom Audiences is that these are people who have proven to engage with you before. They’ll likely engage again, so you can typically get great results with these groups. 4. 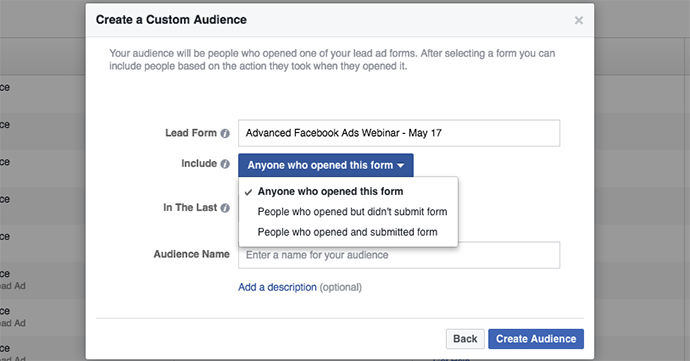 Lead Ad Custom Audiences: If you use Lead Ads, you absolutely must create audiences of those who open lead ad forms or open and submit. One weakness of Data Custom Audiences is that the information provided by your customers may not match up with a Facebook user profile. However, if someone opens or submits a form, Facebook knows it — and the content provided is no longer critical. 5. Video View Custom Audiences: I know that many advertisers struggle to efficiently build an audience of people to target. Even if you are driving traffic with helpful blog posts, it can cost upwards of 25 cents just to get a single click. That makes building a Website Custom Audience slow and potentially expensive. Video, though, is another good top-of-the-funnel option. 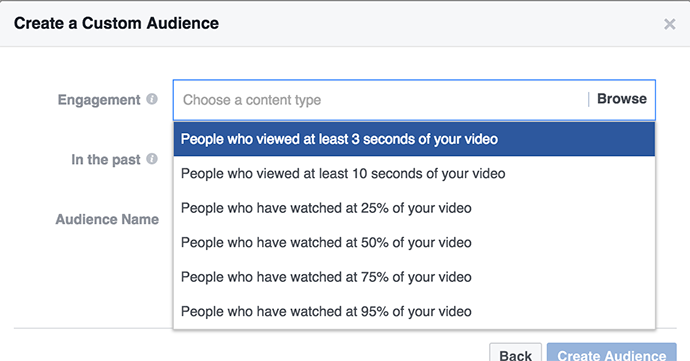 You can create audiences of people based on how much of your video they watched. Depending on the percentage, the cost of a video view might be a fraction of the cost of a website click. While the quality will also likely be lower, this method allows you to build a relevant audience faster and less expensively. 6. 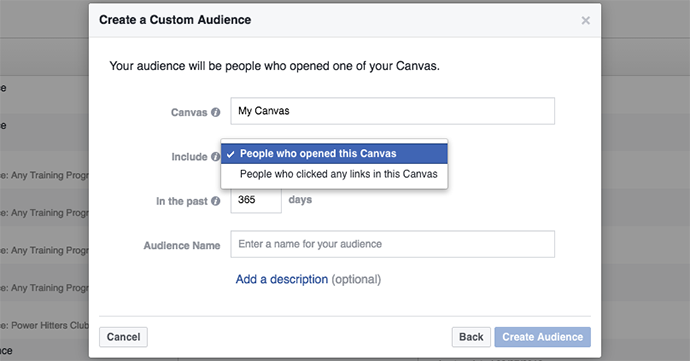 Canvas Custom Audiences: Facebook Canvas is an ad format that allows marketers to tell an interactive story. While the advantage is being able to present multiple media types in a fast loading format, it also means you won’t be driving traffic to your website (unless someone clicks on a link within the Canvas). By creating an audience of anyone who opens your Canvas, you are essentially creating an extension of Website Custom Audiences. 7. Page Likes/Fans: There was a time when building likes or fans was gold. I honestly believe there is still value in this. I built up an audience approaching 150,000 people, and I still get good results here. But I don’t believe it’s as effective as the other methods above. Additionally, quality of this audience is critical. Far too many advertisers have built fan pages with the cheapest likes possible. That strategy does not lead to results when targeting this group. 8. Lookalike Audiences: Lookalike Audiences essentially automate the process of guessing on interests and behaviors you should include when doing top-of-the-funnel targeting. 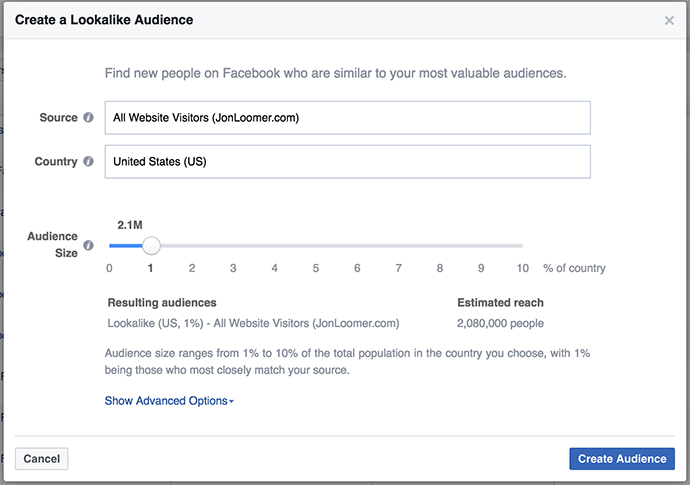 Facebook looks at those in a current audience of yours (custom audience, conversion or page likes) and finds people similar to them. This is a good option to help widen the net when your built-in audience is small in the early going. However, your goal should be to eventually move budget away from lookalikes over time as the other groups above continue to grow. 9. Interests: When Facebook first allowed us to target by interests and behaviors, we about lost our minds. We thought it was the greatest thing in the world. I don’t want you to think this method is worthless. It’s not. But we’re simply spoiled now. You have so many better options. Use those first. The concept of Facebook ad funnels is essentially a continuation of targeting. But you can have good targeting prioritization without using funnels. And if that’s the case, you’re missing out. Too many people use Facebook ads only to sell. Or only to get some type of conversion. There is no funnel. There is a large population of potential customers for you on Facebook. The problem, though, is that we often assume that if they’re ever going to buy, they’re going to buy now. That’s just not true. People are at different stages in likelihood to buy. We need to treat them differently. Additionally, I keep on telling you that the most effective audience for getting efficient conversions is your website visitors. Without some sort of funnel, it will be a huge challenge to build an audience of substance to target. An example of funneling is my evergreen campaign technique. Check it out! People often ask me questions like, “What is the most effective ad type?” I find this to be frustrating and missing the point. First of all, make sure that you use the ad type that is appropriate for your objective. As mentioned earlier, if your goal is conversions, use a link; if your goal is traffic, use a link or carousel ad; if your goal is video views, use a video; if your goal is engagement, use an image (or video). That’s where you start. But man, there aren’t universal truths to this stuff. Try different things. As mentioned earlier, this is often a mistake advertisers make. They hear about success with video ads, so they use a video to get conversions. But in this case, the video is the star of the show. You’re not as likely to click a CTA button on a video as you are on a link ad. And that doesn’t mean that you shouldn’t use video ads. Again, they have their purpose. But understand what is most likely to happen when people see each ad type. Oh, goodness. This one. It’s important! Of course, you MUST use the Facebook pixel to track conversions. I don’t really care whether you use Custom Conversions, Standard Events or both, but you need to use at least one of them. No, Google Analytics is not enough. If you base your results on Google Analytics only, you can’t rely on Facebook referral data. Understand that a conversion doesn’t only result from direct traffic. Those who rely on Google Analytics likely don’t realize this. 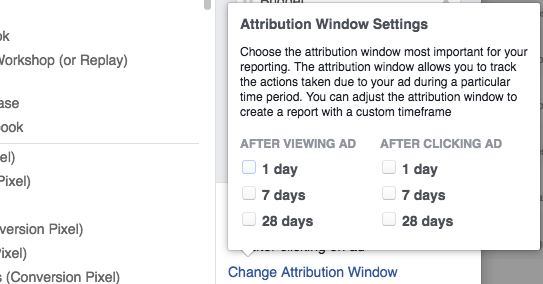 When Facebook reports a conversion, it could be anyone who saw your ad (didn’t click) and converted within a day or clicked your ad and converted within 28 days. The most common example is that someone clicks your ad and visits your landing page. They don’t convert that minute. But maybe they come back later that day. Google Analytics won’t give Facebook credit for that. But they should. Another addition to tracking and reporting is offline conversions. If you aren’t using the pixel or tracking offline conversions, you are only getting a very small picture. As a result, you may make decisions regarding your campaign based on incomplete information. You need to find what works. You don’t just run a single campaign with a single ad set and ad, see it doesn’t work and then claim that Facebook advertising is a failure. So, experiment liberally. Find what is most effective in terms of targeting, optimization, copy, imagery and more. 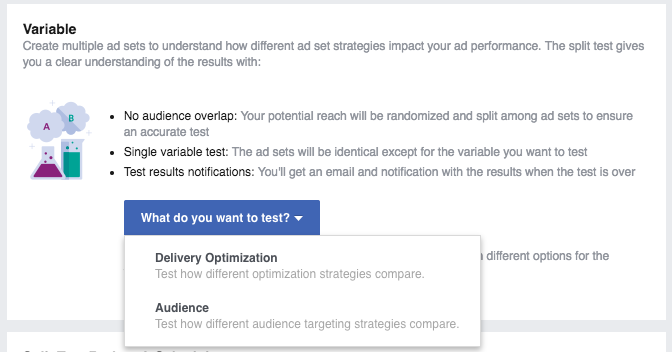 You can do this in an unscientific way (creating multiple campaigns, ad sets or ads where there may be overlap in targeting) or you can use Facebook’s new, built-in split-testing tool. With the scientific approach, Facebook will give you a minimum budget. That’s because enough data is necessary to get meaningful results. But you won’t have a minimum budget otherwise. As a result, make sure that you’re creating a sample size that actually means something. I often hear about advertisers split testing with multiple ads, based on low budgets in the ad set. That may be fine if you’re trying to get engagement, video views or traffic. But if you’re trying to get sales? Think of it this way… If you’re selling a $100 product, it’s going to take time and money to get meaningful results from even one ad set. You should probably spend at least $100 before you can begin to make any assessments. So if you’re splitting up a $100 daily budget among five different ad sets or ads, it’s going to take you much longer. Each conversion will significantly impact your results. These are in order. While copy is important, I hate the suggestion that there is a blueprint or template to how you should use it. I’m sure that there are particular words that have shown to be more effective than others. I’m sure that there’s a study out there showing the precise character count that works best. But that’s in a vacuum, and we don’t operate there. There is no “ideal” length of copy for all audiences and situations. Know your audience and situation and act accordingly. 1. Get to the point in the first couple of lines. That doesn’t mean you should only have a couple of lines of copy. But know that you need to capture your audience’s attention and your copy will eventually cut off. Additionally, text will cut off differently depending on placement. 2. Have some sort of call-to-action. I know it’s crazy, but I’ve seen a lot of ads where people just share the link. That’s it. No commentary, no call-to-action. You need to provide some sort of direction. That doesn’t mean you need to be pushy. It could be “click to learn more” or simply using a CTA button. But let your audience know what you want them to do. 3. Spelling, grammar and formatting are critical. This may seem obvious, but come on now, people. I’ve seen too many bad ads. Formatting includes things like all caps, paragraph/line breaks, etc. Spelling typos and bad grammar can kill an ad. Of course, in all of these cases, we’re still not dealing with universal truths. You still need to know your audience and situation. It’s possible that what seems to be a violation for my audience would work for yours. Once again, advertisers often want to know what the best type of imagery is that they should use. My answer? Look, imagery is important. But if every advertiser’s ad imagery followed the same rules, none of them would work. So just know the purpose of your imagery. It should grab the user’s attention. It should help your ad tell a story. It should have limited text because while the 20% rule may be no more, the amount of text still does impact distribution and costs. Some say faces are more effective. Some favor bright colors. Whatever. Experiment and find what works for you! So these are the things I believe are most important to Facebook advertising success. Any other items you’d add to this list?